The above info came from Who Wants to Know?, and was edited by yours truly (contact me). The image came from YuGiOhKingOfGames.com. In Ancient Egypt, it is said that the Pharaohs used to engage in duels using magical creatures to foresee the future and determine one's destiny. However, when the power got to be too great to control, one wise Pharaoh locked the secret away in seven magical artifacts: a ring, an eye, an ankh-shaped key, a necklace, a rod, a set of scales...and a puzzle. Now in the present day, there is a popular trading card game called Duel Monsters, in which the echoes of the ancient game have been revived. But now, the game has taken on a very sinister twist. Yugi had been a rather ordinary high school sophmore into the Duel Monsters card game...until he unlocked the power of one of the ancient artifacts: the Millennium Puzzle. Now Yugi and his friends have to pit their hearts and their dueling skills against the forces of darkness in struggles for loved ones, themselves, and ultimately the entire world. Is their trust in "The Heart of the Cards" up to the challenge? Note: One episode was cut from the US release, but it was just an inconsequential "Battle City in Review" episode with no impact on the storyline. Also, the first season of Yu-Gi-Oh in Japan was never shown in the US. 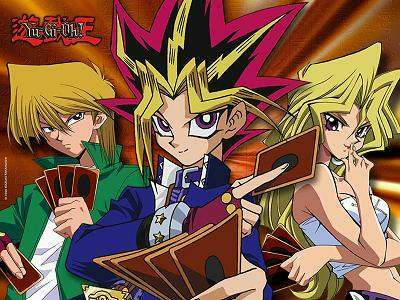 Yu-Gi-Oh Duel Monster is the second Yu-Gi-Oh season in Japan. The above description came from Who Wants to Know? and Panda Doru, and was edited by yours truly (contact me).